As a parent there are some things we just naturally avoid. Like things we know are going to lead to disaster– the toddler, child version of ‘hold my beer’ moments. Like giving your kids cheese-covered anything. They love it, and it’s as much fun watching them equally savor/devour it as it is for them to consume it. In the end though, you’re still left with F 5 cheesy tornado aftermath to deal with. The kind that’s covered your kid and everything in a 5 foot radius with cheese dust, and now you have to use an entire Costco pack of wipes to scrub them down– not necessarily because you don’t want your husband to know you gave them chips for breakfast either. Other things are less dangerous, and yet still we avoid them for our own sanity. Things like giving the kids greasy food. But the cheese dusted food, like cheese balls. Why do we do this?? No matter how many precautions we take, or how careful we are, we are going to be finding little orange finger prints everywhere. Not to mention, once we can finally wrangle them into a still position, cleaning them up is a total battle of wills. Sorry my orange dusted warrior, no you cannot wear that war paint to bed. At least not on my watch. The summer pj shorts you’ve paired with your long-sleeved flannel pajama top though, that I will totally let slide. Just let me snap a picture real quick, because seriously it is cute. And it will go perfectly in your future wedding montage. By now we all know that I’m just as much as sucker for the simple pleasures in life as the sons. Which is why, despite the giant mess we won’t be letting Daddy see, I totally took advantage of a sale I noticed last week and bought us some bags of nacho cheese Doritos. Original, of course, because they’re the best. Usually we pair them with a yummy sandwich for lunches, but on day three- the itch for something different began to get to me. When the kids asked for chicken tenders for lunch, the light bulb went off. Doritos Crusted Chicken Tenders. Bread crumbs are sooooo last year. 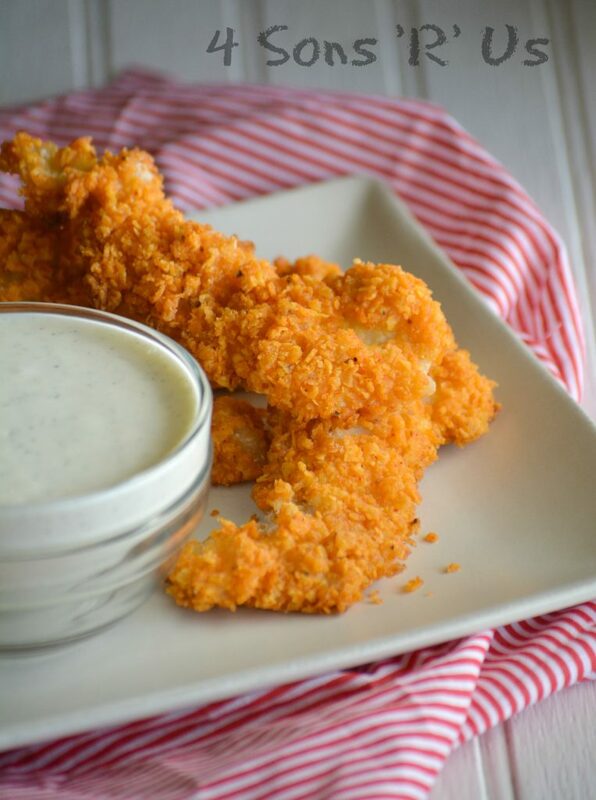 These are some seriously yummy chicken tenders. They appealed to my kids, and the kid in me in totally equal measure. A genius hybrid, they taste just like your favorite classic chip with a tender, juicy chicken center. Even better? 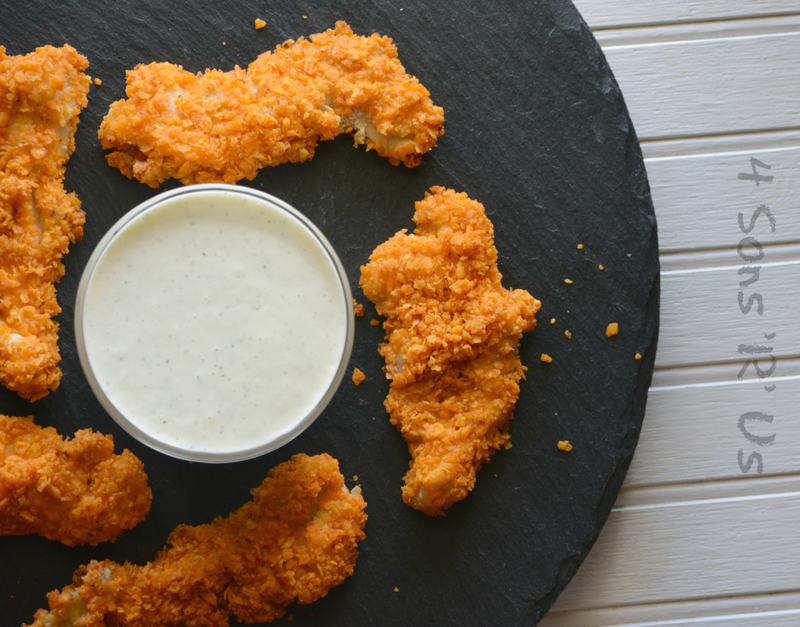 Somewhere in the crumbling, coating, baking steps– these Doritos Crusted Chicken Tenders bake in their famous nacho cheese flavor, and maintain their crisp– but lose the majority of the expected cheese dust residue. 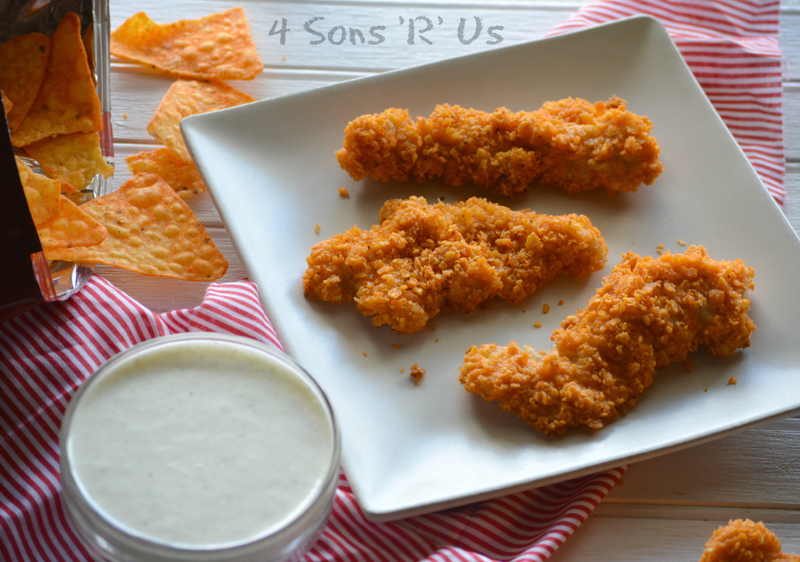 Turn your favorite chips into a crisp, crumbled coating for family favorite chicken tenders. Enjoy dinner, because everyone will be licking their plates instead of their fingers. 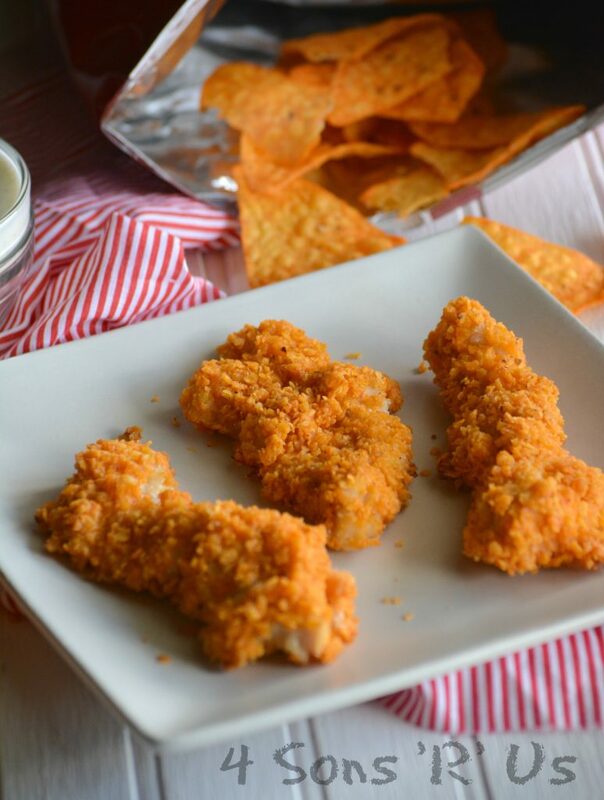 A fun lunch or appetizer that combines nacho cheese flavored Doritos with crunchy chicken tenders. Working with one breast at a time, cut it into thin strips, about 1/2" each, until you've finished with all four breasts. Transfer the strips to a medium-large tupperware. Pour the buttermilk evenly out over top, and seal with it's lid. Let the chicken marinate at least two hours, flipping the container once or twice throughout, to ensure an even marinade. Let the air out of the Doritos bag. Hold the end closed and roll lightly over the chips with a rolling pin once or twice. Transfer the broken chips to the bowl of a food processor. Lightly pulse until the chips have crumbled and resemble course panko-style crumbs. Turn the chips out onto a large, flat plate. Add the flour to a separate plate, and use a fork to gently stir in the cayenne pepper-- if using. Beat the eggs in a separate bowl until scrambled. Then line them up in order of use: chicken, flour, eggs, chips. You can use your fingers, but I recommend a fork to keep the various things from getting clumpy and contaminated. Spear a chicken strip, and let it drip a second or two to remove any excess buttermilk. Dredge them in the flour to coat completely. Shake off any excess flour before dipping them in the egg wash. Again, let any excess drip off, and then transfer them to the plate of Doritos breading. Dredge until completely coated with Doritos crumbs. Remove the prepared chicken strip to a baking sheet that's been lightly coated with non-stick cooking spray. Repeat until all the strips are done. Bake the tenders at 400 degrees for 10 minutes. Remove from the oven, use tongs to turn the tenders, and return to the oven. Bake an additional 5-10 minutes, or until the chicken tenders are completely cooked through. These pair perfectly with a good creamy ranch dressing, for dipping. BUT, if your kids are like mine, they'll want them served with ketchup. Don’t like nacho cheese flavor? Do you absolutely adore a different flavor or Doritos? What about Cool Ranch or Thai Chili? Both make yummy breading. Pair them with barbecue sauce or your favorite Asian dipping sauce, respectively, for other fun flavor options. This is a fabulous post and seems very delicious…….